Cross-platform support? BioWare loves the idea of letting freelancers on all platforms play together, according to Robertson, though the studio has nothing to announce at this time. More Javelins. Robertson said "we want to add more Javelins in the future," so while there's nothing about this on the Anthem roadmap, it's definitely on the table. Darrah affirmed more Javelins are a possibility, but for the moment, that's all they are. Spectator cam on death. Getting downed in Anthem is a total gut-punch since you can't move or do anything until you're revived. To help alleviate the inactivity, Darrah says BioWare is looking into adding a spectator camera that would let you shadow your friends, though it probably won't be available at launch. Colored thrusters. You can customize just about every inch of your Javelin in Anthem, but the color of your thrusters is locked. Happily, Darrah says they'd love to make thrusters customizable too. In another tweet, he said BioWare is also interested in more Javelin-specific options. Romance paths? If you're looking to smooch some of Anthem's many characters, Darrah has good news for you. As he put it, there's "nothing stopping us in the future if people want" romance options. In a separate tweet, he affirmed there are no current plans, but hey, it's something. Elemental weapons. Anthem's combo system is currently driven by abilities that prime and detonate elemental buildup, but according to Irving, elemental weapons will eventually be added into the mix. They won't cause combos, but they oughta be pretty powerful anyway. Today's AMA wasn't all optimistic speculation, mind. BioWare also poured cold water on a few things. Robertson said there won't be a way to explore Freeplay in a private session - that is, totally on your own with no-one else around. Similarly, Darrah said strongholds won't be soloable on all difficulties. There won't be a companion app either, Darrah said. Irving also confirmed that there won't be a training room to test new guns and abilities, which is a huge bummer in my mind. Oh, and don't expect parties larger than four anytime soon, if ever. Phew! That was a lot of things. 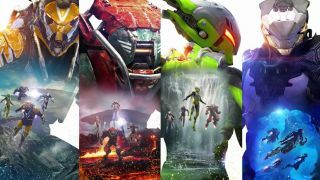 If you're still hungry for more things, have a look at the updated Anthem roadmap, which outlines major updates coming in March and beyond. As it happens, a tweet from Robertson also suggested Anthem saves will transfer to PS5 or Xbox Project Scarlett if it's playable on next-gen consoles. It's not an announcement, but it's certainly interesting.